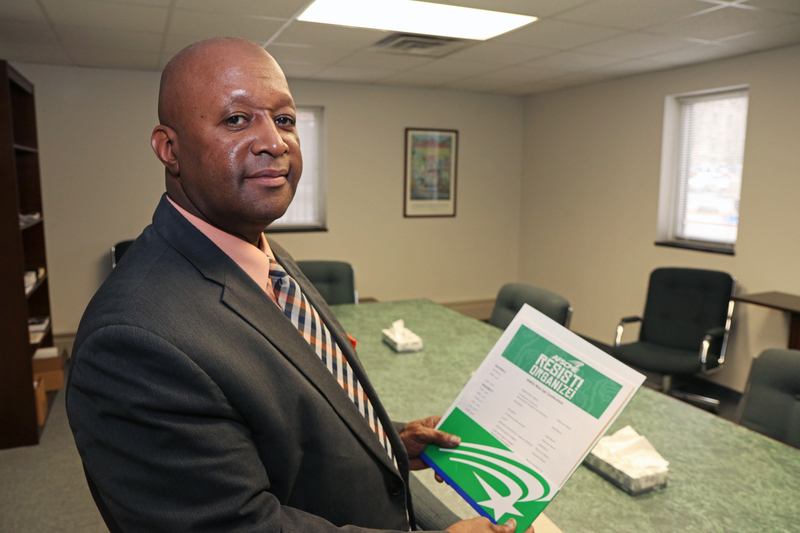 CSEA activists play a key role in helping grow our union through AFSCME’s Volunteer Member Organizer (VMO) program. As a VMO, our members help build our union through engaging potential or new members through one-on-one conversations about their workplace concerns, often at homes. While the VMOs often work with staff organizers, the VMOs also bring something else to the table — their own experiences as union members. 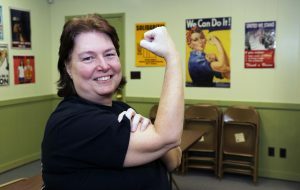 During their efforts to reach out and engage potential or new members, VMOs often discuss the value of being part of a strong union, including fair pay, benefits, safer work conditions and secure retirements; standing together for fairness and justice and even access to a greater level of resources to help save money, among many other benefits. After all, no one can better speak about the value of the union experience better than a union member. As we continue to face challenges from anti-union groups, it’s more important than ever to reach out to these workers to have one-on-one conversations. This is how we will stay strong. Several CSEA activists recently joined our union sisters and brothers from around the country for AFSCME’s Volunteer Member Organizer Rise Up Conference in Nevada. They learned to be better organizers and shared the successes we’ve been having with strengthening our union. 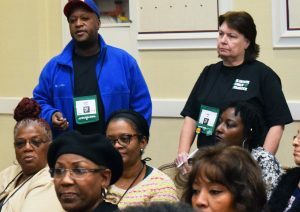 CSEA Southern Tier State Employees Local President Leslie Briscoe, Herkimer County Local President Beth Hall and Village of Warsaw Police Department Unit President Scott Kelly were among more than 160 union members who attended the AFSCME Volunteer Member Organizer Rise Up conference held last October. While there, they heard from our International union leadership, participated in skill-building trainings and panel discussions, and went out and spoke with unorganized Nevada state employees. Up conference that he recently attended. For Briscoe, a customer service representative supervisor at the New York State Insurance Fund’s Workers Compensation and Disability Division in Glendale, the main lesson he learned was that most unions face similar challenges. He also said it was personally eye-opening to learn that Nevada state workers were earning less on average than local government workers in similar jobs, opposite of how things typically are in New York. “I wanted to share my comparison with them of working in New York State to let them know how important it is to be union,” he said. mimics the Rosie the Riveter pose. She said she used the opportunity to share with attendees the successes CSEA has had with our Member Engagement Program. 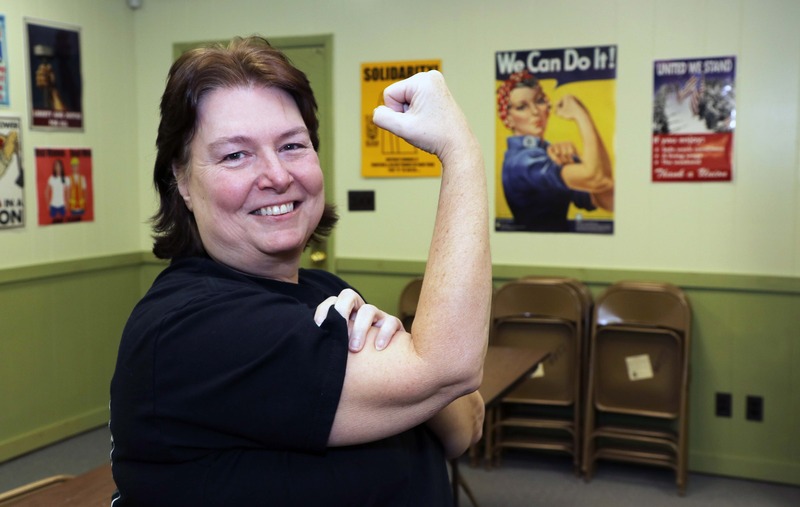 She also shared tactics for growing interest in her local union like holding lunch and learn workshops, informative trainings, and publishing newsletters. “It basically gave me another opportunity to network with other activists throughout the country and share different ideas,” Hall said. Kelly, who works as a school resource officer, said the conference gave him an opportunity not only to network with other volunteer member organizers, but to further develop his skills. Hall, Briscoe and Kelly said they appreciated the opportunity to go out and organize workers. Hall added that it was motivating to see others who are as supportive of unions as she is. When Kelly met with the Nevada state employees, he not only noticed strong differences between public employees in New York and Nevada, but many similarities.